Home•air conditioning•Are You Operating Your Furnace Safely? Modern furnaces are engineered with variety of features and redundancies to ensure safe operation and reduce untoward incidents involving gas lines and fire. As homeowners fire up their heating systems during the colder months, it’s important to keep in mind a few safety pointers to make sure your furnace runs safely and efficiently throughout the season. 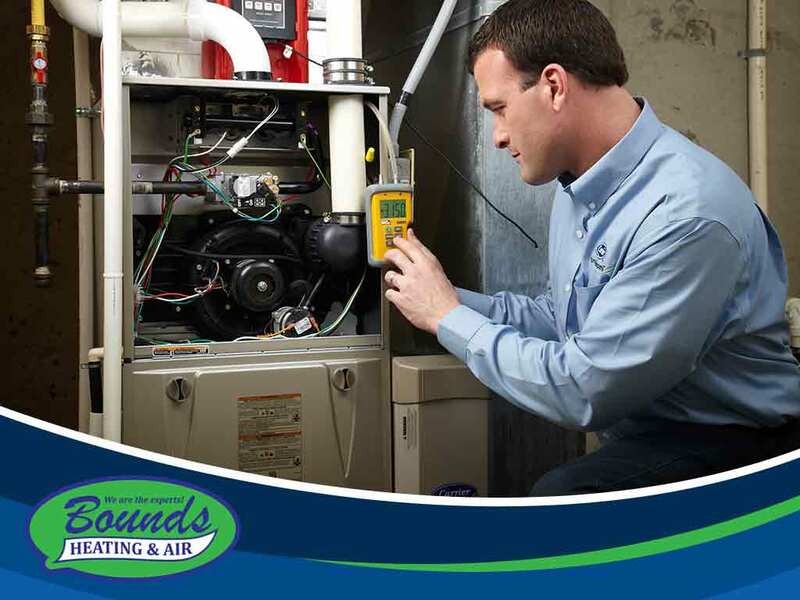 Our HVAC repair experts at Bounds Heating & Air have compiled a short list of reminders about the proper way to safely operate your furnace below. The old adage “an ounce of prevention is worth a pound of cure” rings just as true when it comes to your heating and cooling system. There’s no better way to guarantee safety than to have a professional come in and perform a full inspection of your furnace. These routine procedures are typically completed before the heating season begins, but you can choose to avoid the pre-winter rush and schedule a maintenance visit a few days into it. Consider having your annual or seasonal inspections include air conditioning repair and maintenance as well. Your cooling system works hand in hand with your furnace in making your home comfortable, and keeping it in excellent condition will contribute to the quality and performance of the entire system. Blocked flue pipes are a potential carbon monoxide (CO) hazard. CO is an odorless and colorless gas that can cause disorientation, respiratory problems, and in the worst cases, death. Luckily, furnaces have a standard built-in carbon monoxide detector to alert you to any leaks. Having these detectors regularly checked, maintained and repaired is essential to overall home safety. Over time, furnace filters will get congested with soot and smoke. Dirty filters reduce airflow to your vents, and can cause your heating bills to increase. Cleaning or changing your filters at least once every quarter should always be part of your regular HVAC maintenance schedule to ensure your furnace performs as it should. This winter, turn to Bounds Heating & Air for your heating needs. We’re the number one provider of HVAC products, repair and maintenance. Give us a call at (352) 278-9123 or fill out our contact form. We serve clients in Lake City, FL.